DNA microarray profiling performed on clinical tissue specimens can potentially provide significant information regarding human cancer biology. Biopsy cores, the typical source of human tumor tissue, however, generally provide very small amounts of RNA (0.3–15 μg). RNA amplification is a common method used to increase the amount of material available for hybridization experiments. Using human xenograft tissue, we sought to address the following three questions: 1) is amplified RNA representative of the original RNA profile? 2) what is the minimum amount of total RNA required to perform a representative amplification? 3) are the direct and indirect methods of labeling the hybridization probe equivalent? Total RNA was extracted from human xenograft tissue and amplified using a linear amplification process. RNA was labeled and hybridized, and the resulting images yielded data that was extracted into two categories using the mAdb system: "all genes" and "outliers". Scatter plots were generated for each slide and Pearson Coefficients of correlation were obtained. Results show that the amplification of 5 μg of total RNA yields a Pearson Correlation Coefficient of 0.752 (N = 6,987 genes) between the amplified and total RNA samples. We subsequently determined that amplification of 0.5 μg of total RNA generated a similar Pearson Correlation Coefficient as compared to the corresponding original RNA sample. Similarly, sixty-nine percent of total RNA outliers were detected with 5 μg of amplified starting RNA, and 55% of outliers were detected with 0.5 μg of starting RNA. However, amplification of 0.05 μg of starting RNA resulted in a loss of fidelity (Pearson Coefficient 0.669 between amplified and original samples, 44% outlier concordance). In these studies the direct or indirect methods of probe labeling yielded similar results. Finally, we examined whether RNA obtained from needle core biopsies of human tumor xenografts, amplified and indirectly labeled, would generate representative array profiles compared to larger excisional biopsy material. In this analysis correlation coefficients were obtained ranging from 0.750–0.834 between U251 biopsy cores and excised tumors, and 0.812–0.846 between DU145 biopsy cores and excised tumors. These data suggest that needle core biopsies can be used as reliable tissue samples for tumor microarray analysis after linear amplification and either indirect or direct labeling of the starting RNA. Recent studies suggest that DNA microarray profiling performed on clinical specimens may provide information directly applicable to cancer diagnosis and treatment. One application of microarray analysis is aimed at differentiating subgroups of cancers using gene expression profiling, also referred to as class discovery [1–4]. Golub et al. used gene expression profiling of patient leukemia cells to distinguish acute myeloid leukemia (AML) from acute lymphoblastic leukemia (ALL) . Moreover, they showed that subsets of leukemia cells that morphologically appeared to be ALL had a gene expression profile and response to therapy that was more consistent with AML, thus a new class of leukemia was described. Microarray analysis was also used to identify a subset of ALL tumors with a distinct gene expression profile that respond poorly to standard therapy . Subgroup profiles have also been developed for other histologically homogeneous tumors such as diffuse B-cell lymphomas and hereditary breast cancers [2, 3]. A diffuse large B-cell lymphoma (DLBCL) tumor cohort was divided into subsets of tumors with distinct gene expression profiles that correlated with overall survival . Hedenfalk et al. compared gene expression profiles of breast tumors from women with and without BRCA1 or BRCA2 mutations. They showed that these two classes of breast tumors displayed different gene expression profiles and created a BRCA1/BRCA2 subclass. Such studies aimed at delineating the gene expression profiles of subtypes of tumors that exist within a purportedly homogeneous tumor population may not only aid in cancer diagnosis, but may also provide novel insight into the genetic mechanisms of oncogenesis. In addition to cancer diagnosis, gene profiling is being explored as a means of predicting tumor treatment response, a long sought after goal of clinical oncology. Towards this end, a number of studies have related tumor gene expression profiles to treatment outcome and response to a given cytotoxic therapy, a process termed class prediction. Tumor gene expression profiles were generated for a series of patients with esophageal cancer treated with surgery and adjuvant chemotherapy resulting in the identification of an expression profile that correlated with longer survival and possibly tumor chemosensitivity . Similarly, clinical outcomes and gene expression profiles were compared in subsets of patients with longer survival in B-cell lymphomas, AML and breast cancer, which produced gene expression profile that correlated with tumor response in each of these tumor types [6–8]. Thus, initial reports have suggested that incorporating gene expression profiling into clinical trials may provide novel information relevant to both cancer diagnosis and treatment. However, to fully investigate the potential clinical applicability/value of microarray analysis will necessitate the performance of large prospective clinical trials. Such trials will confront a number of confounding variables including the uniform collection and preparation of RNA , the stability of the reference and experimental samples over a prolonged period  and microarray quality control over time . However, the most significant impediment to performing these studies is likely to be the small size of the tumor biopsy. In a recent study of fifty-five breast biopsies obtained using a 14-gauge needle, the median recovery was only 1.34 μg of RNA (range 100 ng–12.6 μg) . Moreover, Assersohn et al. in their analysis of breast fine needle aspirates reported a mean recovery of 202,500 cells, which would correspond to approximately 100 ng of RNA . Because obtaining multiple biopsies from the same patient will likely be the exception, in most clinical trials the majority of gene expression profiles will have to be generated from single core biopsies that are likely to yield these small amounts of starting RNA material. Thus, in an attempt to optimize and validate procedures for tumor sample sizes relevant to the clinical setting, we have performed a series of microarray based gene expression analyses on core biopsies from human tumor xenograft models. These studies included the evaluation of the representative nature of amplified RNA compared with the original RNA sample, a comparison of direct and in-direct methods of probe labeling and the determination of the minimum starting RNA material needed to perform a valid and representative amplification. Total RNA was isolated using TRIzol® reagent (Invitrogen) and purified with RNeasy® mini kits (Qiagen) according to the manufacturer's instructions. RNA samples and Universal Human Reference RNA (Stratagene) were amplified one or two rounds using RiboAmp® RNA Amplification Kits (Arcturus) per manufacturer's instructions. Starting RNA quantity varied by experiment, between 0.8 and 10 μg of whole tumor samples. The reference RNA for these experiments was amplified using 10 μg aliquots of Universal Reference. All amplified samples were purified with an RNeasy® Kit according to the manufacturer's instructions and samples assessed for purity by agarose gel electrophoresis, and spectrophotometry was used to determine concentration. For direct labeling ten micrograms of amplified universal human reference were labeled with cyanine 5-dUTP (Cy5) and 5 μg of amplified U251 RNA samples were labeled with cyanine 3-dUTP (Cy3) using SUPER-SCRIPT II and Oligo (dT) 12–18 (Invitrogen). The method described by Khan et al., was followed . Labeled probes were purified using Micro Bio-Spin 6 Chromatography Columns (Bio-Rad Laboratories) and purified using Microcon-30 spin columns (Millipore, three 400 μl TE washes used). The final elution was taken up to 17 μl with TRIS EDTA. For indirect labeling of total RNA, 20 μg of both sample and reference were diluted into a total of 12 μl of DEPC water. For amplified RNA, starting material was reduced to 3 μg of both sample and reference, also diluted into a total of 12 μl of DEPC water per sample. For total RNA, 1 μl of 500 ng/μl oligonucleotide d(T)12–18 (Stratagene Fairplay Kit) was added to each tube for cDNA priming. Amplified samples had 1 μl of 3 μg/μl random primer (Invitrogen) added to each reaction tube. Samples were incubated at 70°C for 10 minutes, and cooled on ice. Each sample then had the following components added: 2 μl of 10 × StrataScript reaction buffer (Stratagene Fairplay Kit), 1 μl of 20 × dNTP mix, 1.5 μl of 0.1 M DTT, and 0.5 μl Rnase Block. Subsequent to mixing, 1 μl of 50 U/μl StrataScript RT was added to each tube and tubes were incubated at 48°C for 25 minutes. Another aliquot of 1 μl StrataScript RT was added to each tube, and tubes were incubated for an additional 35 minutes. The resulting cDNA was purified using a MINElute Kit (Qiagen). Samples were next coupled to either 111 μg of monofunctional dye for total RNA-derived cDNA, or 55 μg of monofunctional dye for amplified RNA-derived cDNA. Reference RNA was always labeled with Cy5; tumor samples were labeled with Cy3. Microarray Slides were obtained from the Radiation Oncology Sciences Program Microarray Lab at the National Institutes of Health . Slides were 8 k human slides printed on site using a Named Genes clone set from Research Genetics (Huntsville, AL), spotted onto poly-L-lysine coated slides using an OmniGrid arrayer (GeneMachines, San Carlos, CA). Slides were pre-hybridized for at least one hour at 42°C with 40 μl of pre-hybridization solution consisting of 5 × SSC, 0.1% SDS, and 1% BSA. Solution was loaded under M Series Lifterslips (Erie Scientific). Pre-hybridization solution was washed off by rapidly plunging the slides in distilled water for 2 minutes, followed by 100% isopropanol for 2 minutes. Slides were allowed to air dry prior to sample hybridization. Cy3 and Cy5 labeled targets were combined together for hybridization after dye-coupled cDNA purification. 1 μl of human COT-1 DNA (Invitrogen) and 1 μl of pd(A)40–60 (Amersham Biosciences) was added to each tube. Targets were denatured at 100°C for 1 minute before snap cooling on ice. 20 μl of pre-warmed (42°C) 2 × F-Hybridization Buffer (50% formamide, 10 × SSC, 0.2% SDS) was added to each sample. The combined target/hybridization solution mixture was incubated at 42°C for one minute, mixed and loaded onto microarray slides. Humidity was maintained in each chamber through the addition of 20 μl of DEPC water. Slides were hybridized at 42°C overnight. Post-hybridization washing included: 5 minutes in 2 × SSC + 0.1% SDS, 5 minutes in 1 × SSC, 5 minutes in 0.2 × SSC, and finally 1 minute in 0.05 × SSC. Slides were dried in a centrifuge set for 25°C at 650 rpm for 3 minutes. Slides were scanned at 10 microns using a Genepix® 4000 scanner (Axon Instruments), and images and data were stored in a database (mAdb) maintained by the Center for Information Technology, National Institutes of Health. Data was extracted into two categories using the mAdb system: "all genes" and "outliers". "All genes" were extracted excluding spots flagged as Bad/Not found, and spots with target diameters less than 50 μm or greater than 300 μm. "Outliers" were defined as spots with a signal to background ratio ≥2, and an overall signal ≥1,000, genes required values in 100% of arrays, and the expression ratio was ≥2 or ≤0.5. Spots were included if either channel was ≥2,500 but the other criteria were unmet. Target pixels were 1 SD above the background ≥80%. After extraction, scatter plots were generated for each slide and Pearson Coefficients of correlation were obtained. Expanding clinical applications of cDNA microarrays necessitate the ability to perform arrays with relatively minute starting amounts of RNA. The most commonly used method to increase the amount of RNA from a clinical specimen to a level suitable for analysis is through RNA amplification . However, whether the gene expression profile generated from amplified RNA is representative of that obtained from total RNA has been the subject of some controversy . To address this issue in our system, two replicates of amplified RNA and un-amplified RNA, derived from sc U251 tumors, were hybridized against amplified reference and un-amplified reference RNA, respectively. Scatter plots comparing the total gene expression level of the 2 amplified samples to each other and the 2 original RNA samples to each other (figures 1a and 1b) resulted in high correlation coefficients indicative of the reproducibility of the microarray platform used in these studies. Earlier publications have determined that a threshold of 0.70 for the concordance value is a marker of reproducibility [13, 16]. Higher correlations within groups were obtained when just the outliers were compared (Figures 1d and 1e), consistent with prior studies . 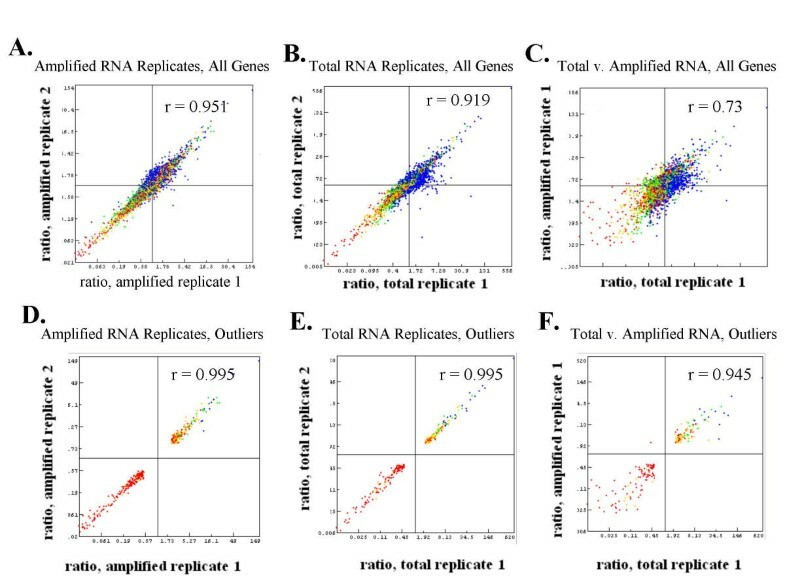 Comparison of the original RNA samples to the amplified samples from in vivo biopsy cores yielded similar correlation coefficients, and once again, the outlier genes have a higher coefficient than the all gene group (figure 1c and 1f). The outlier genes obtained for the original RNA and amplified RNA samples were also compared. Replicates for each group were averaged and the number of outliers in each determined (data not shown). In the original RNA sample 263 outliers were detected, 67% of those were also detected within the amplified RNA sample. Therefore, the amplification of the RNA material from a U251 tumor biopsy core maintained the majority of outlier genes found in the un-amplified sample. Correlations using amplified and total RNA isolated from U251 tumor. (A) Correlations between gene expression ratios for all genes using amplified RNA replicates 0.951 (n = 6,841 genes) and (B) total RNA replicates 0.919 (n = 6,981 genes). (D) and (E) represent scatter plots and correlations obtained for amplified 0.995 (n = 456 genes) and total replicates 0.995 (n = 274 genes), respectively, for outlier gene expression. (C) and (F) Representative correlation between total and amplified RNA from one sample 0.73 for all genes (n = 6,987 genes) and 0.945 for outliers (n = 203 genes). Extraction methods for all genes and outliers are found in the methods. Although a high concordance existed between our amplified and non-amplified specimens, the amount of starting RNA material for these experiments was greater than what might be expected from a core biopsy from a patient's tumor. We amplified 5 μg of RNA, whereas typical biopsy core specimens obtained in our clinic using a 14-gauge needle yield 0.3–3 μg of RNA (unpublished data). To determine the amount of RNA starting material needed to amplify and maintain a high concordance with the original biopsy specimen, serial dilutions (5 μg, 0.5 μg, and 0.05 μg) of LnCaP tumor biopsy material was used for amplification. Orthotopic LnCaP tumors were used in this study to validate that the high correlation seen in the earlier experiments were not specific to sc xenograft tumors. To control for the potential influence of varying the reference to sample RNA ratio, reference RNA was correspondingly serially diluted to 5 μg, 0.5 μg and 0.05 μg of starting material. All samples were then amplified 2 rounds to generate enough material for hybridization. The comparison of 5 μg of un-amplified RNA versus amplified RNA of this orthotopic tumor model showed similar coefficients to the ones derived from the sc U251 model suggesting that the site of tumor growth does not influence the concordance values (figure 2a). However, the resulting Pearson Coefficients indicate a decreasing similarity to the original specimen as the starting amounts of material are reduced (figure 2a/2b/2c). 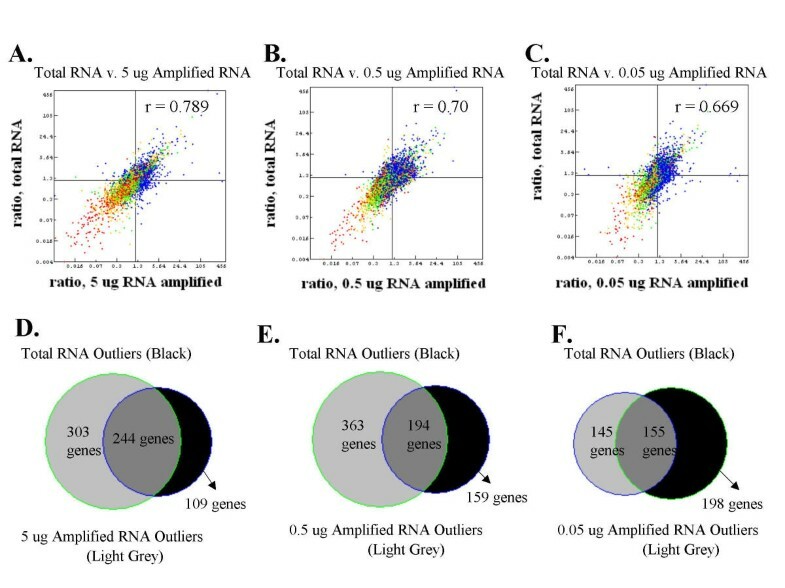 We also examined outlier concordance by determining the percentage of original RNA outliers detected in the 5 μg, 0.5 μg, and 0.05μg of amplified samples. Three hundred and fifty three genes were identified as outliers for 5 μg of un-amplified RNA, while, 547, 557 and 300 genes were outliers in the 5 μg, 0.5 μg, and 0.05 μg amplified specimens, respectively (figure 2d/2e/2f). The overlap in outliers between the 5 μg of original RNA and each amplified specimen was 244 (69%), 194 (55%), 155 (44%) genes. Although there was concordance between the 5 μg amplified and the original specimens for outlier identification, a 44% concordance for the outliers in the amplified 0.05 μg sample compared to the 5 μg original sample is below the 0.70 concordance value sited in the literature as a marker of reproducibility . RNA detection limits. (A) Total RNA versus 5 μg amplified RNA yielded a coefficient of 0.789 after two rounds of amplification (n = 6,096 genes) (B) The correlation for all genes between total RNA and a serially diluted 0.5 μg aliquot that was removed from the 5 μg sample and amplified 2 rounds yielded a coefficient of 0.7 (n = 6,102 genes). (C) The correlation between gene expression ratios for all genes between total RNA and a 0.05 μg aliquot that has been serially diluted from the 0.5 μg aliquot yielded a coefficient of 0.669 (n = 6,114 genes). (D-F) Venn diagrams depicting outlier concordance between the samples featured in (A-C, respectively). Extraction methods for all genes and outliers are found in the methods. An additional parameter that can determine the amount of starting RNA material needed is the method of fluorophore labeling. The two methods used to fluorescently label cDNA probes are direct labeling and indirect (amino-allyl) labeling. As the indirect method require less starting material and less expensive labeling dye, it was important to determine whether the data generated from these labeling methods was interchangeable. Two replicates of amplified RNA from the U251 sc tumor sample and reference RNA were labeled via each method, microarray analysis performed and scatter plots generated. Pearson Coefficients were generated to determine similarity. For direct labeling, 5 μg of experimental sample and 10 μg of reference was used and for the indirect method 3 μg of both the experimental sample and reference was used. The reproducibility of the hybridization results for both the direct or indirect method of probe preparation using this microarray platform was indistinguishable for the all gene groups (figure 3a/3b). Similarly, the outlier coefficients from each labeling method were extracted and the directly labeled replicates yielded a Pearson Coefficient of 0.992 for outliers (n = 647), and indirectly labeled replicates yielded a Pearson Coefficient of 0.99 for outliers (n = 588) (data not shown). When directly comparing the method of probe preparation (figure 3, representative image), a high correlation was observed in the hybridization results. Therefore, while using less amplified RNA starting material, the indirect method of probe preparation yields similar results to directly labeled samples. Scatter plot images and corresponding Pearson Coefficients between direct and indirect labeling methods. (A) Scatter plot of direct labeling replicates yielding a Pearson Coefficient of 0.948 for all genes (n = 7,476 genes). (B) Scatter plot of indirect labeling replicates yielding a Pearson Coefficient of 0.924 for all genes (n = 7,474). (C) A representative image of a comparison of the gene expression ratios between a direct and indirectly labeled slide. The average Pearson Coefficient generated comparing labeling methods was 0.895 for all genes (range 0.883–0.911, n = 7,474 genes). Extraction method for all genes is found in the methods. After determining the limits of RNA amplification and the optimal method of probe labeling we simulated a patient biopsy procedure. Three core specimens were taken from a xenograft tumor, representing the patient biopsies, and the remainder of the tumor was harvested to represent the entire gene expression profile. Samples were obtained from two tumor types, DU145 and U251, both grown in the flank of SCID mice. The DU145 samples were flash frozen in liquid nitrogen, whereas the U251 samples were stored in RNAlater. As the use of liquid nitrogen can be cumbersome in the operating room, the reagent RNAlater has been used to preserve RNA specimens at room temperature for up to 24 hours. Therefore, we included specimens stored in RNAlater to determine whether the specimens maintained fidelity. All core samples, range of original RNA 0.8 μg to 5 μg, were amplified and 3 μg of amplified RNA was indirectly labeled and hybridized against amplified human reference. Individual cores served as biologic replicates; 2 excisional tumor biopsies were obtained and each was analyzed in duplicate. Comparison of the DU145 excisional biopsy cores generated average coefficients of 0.90 for all genes (n = 6,711 genes), and 0.99 for outliers (n = 363 genes)(data not shown). Similarly, U251 excisional biopsies yielded an average coefficient of 0.90 for all genes (n = 7,078 genes) and 0.98 for outliers (n = 494 genes). The similarity between the coefficients obtained for the U251 and DU145 hybridizations suggests that storage of samples in RNAlater reagent does not influence the results obtained from microarray hybridization. The similarity between the individual cores and their corresponding excisional biopsy samples for both DU145 and U251 was then assessed according to Pearson Coefficients (Table 1). For each tumor the individual cores had correlations that ranged from 0.75 to 0.85 when compared to the whole tumor specimen for all genes and 0.95–0.97 for the outliers. Therefore, in these in vivo model systems the gene expression profile generated from needle core biopsies correlated to the gene expression profile of the whole tumor. As microarray technology enters mainstream usage in clinical oncology for class discovery and class prediction, a major confounder in the generation of gene expression profiles is likely to be the necessity of using small tissue samples (<1 μg). To address this issue, we investigated xenograft tumors to evaluate the similarity between amplified and non-amplified specimens, the minimal amount of starting material for RNA amplification that retains fidelity, and the method of fluorophore probe labeling. To our knowledge, this is the only study reported to date evaluating all three of these variables in one xenograft experiment. We then simulated a patient needle core biopsy to determine whether the gene expression profile generated from such a biopsy is representative of the tumor. A number of publications on the fidelity of amplified RNA compared to total RNA generally conclude that the amplified RNA does represent the total RNA sample particularly when comparing the outlier gene pattern [18–25] As noted by Nygaard et al., however, gene expression ratios are not always fully preserved . In these publications, various starting material amounts, methods of analysis, and methods of amplification varied greatly. Feldman et al. recently demonstrated the advantages of mRNA amplification for microarray analysis, however, in their study cultured murine tumor cell lines were used . The data presented here is consistent with those obtained from in vitro murine cell lines in that it illustrates that total RNA from human xenografts can be purified, amplified and hybridized using commercially available kits to result in similar gene expression profiles for amplified RNA versus total RNA . After validating that amplified RNA and total RNA preparations yielded similar results for all genes as well as the outliers, we determined the amount of starting material needed to begin the amplification process and retain fidelity. Nygaard et al. recently published that 0.2 μg of total RNA amplified 2 rounds yields an average correlation between amplified and non-amplified arrays ranging from 0.71 to 0.84 . Similarly, Wang started with total RNA in the 0.25–3.0 μg range and demonstrated no affect on the fidelity or reproducibility of amplification compared to the total RNA samples . In each of these studies the starting material was from cell culture. The results presented here using starting material from human xenograft models agrees with their findings: 0.5 μg of total RNA amplified 2 rounds has a Pearson Coefficient of 0.7 when comparing the amplified RNA and total RNA specimens. Because the amount of material generally obtained from needle core biopsies is typically between 0.3 and 5 μg these results suggest that the amount of amplified RNA generated from patient core biopsies can provide sufficient material for microarray analysis. However, these data also suggest that as the amount of total RNA starting material decreases the coefficient of similarity to the original specimen also decreases, which may contribute to inconsistencies in data interpretation. The two common labeling methods for microarray analysis are direct and indirect (amino-allyl) labeling . Direct labeling, which directly incorporates labeled nucleotides into cDNA during reverse transcription, is biased towards the incorporation of Cy3 dye. This may be due to either the inability of the reverse transcriptase (RT) enzyme to efficiently incorporate bulky Cy-labeled dUTP or the Cy labeled dye may be insoluble under RT conditions. Indirect labeling overcomes this bias by incorporating the less-bulky amino-allyl modified nucleotides into cDNA followed by the coupling of Cy3 and Cy5 to the amino-allyl groups. Previous comparisons of the direct and indirect labeling methods have shown similar hybridization results, however, they have used total RNA derived from cell culture or large amounts of normal tissue starting material [28–30]. We have expanded upon this data by verifying in a human xenograft model that the results of hybridization comparisons between the direct and indirect labeling methods produced similar results and can therefore be directly compared. As the indirect method uses less amplified starting material to produce a probe, more hybridizations can be performed than with the direct labeling method. Having established that amplified RNA labeled indirectly from a human xenograft model could be used for microarray analysis, it was then necessary to establish that core biopsies would generate representative expression array profiles compared to excisional biopsy material. Sotiriou et al. using human tumor xenografts obtained a coefficient of 0.87 between two cores from the same tumor using amplified RNA and coefficients of 0.77 and 0.78 between excisional biopsy total RNA and resultant core biopsy amplified RNA . Assersohn et al., also using a human xenograft model, found a correlation of 0.76 between cores and 0.69 between cores and whole tumor extracts . Our findings for the coefficients between cores and the whole tumor were in agreement with these studies (range 0.75–0.85). As the most common method of biopsy storage is to flash freeze the specimen in liquid nitrogen, the majority of our specimens were prepared in this manner. However, the use of liquid nitrogen can be cumbersome to use in the operating room. Recently, the reagent RNAlater has been used to preserve RNA specimens at room temperature for up to 24 hours. To evaluate this storage reagent, U251 tumors were biopsied and stored in both liquid nitrogen and RNAlater. Consistent with prior studies, similar coefficients were derived using either method of storage. Thus it appears that snap freezing with liquid nitrogen or the more convenient use of RNAlater is equivalent. The data presented in this paper demonstrate that very small amounts of human xenograft tissue (as low as 0.5 μg) can be amplified generating results that faithfully represent the corresponding total RNA samples. Fifty-five percent of total RNA outliers were detected with this amount of starting material. Because typical core biopsies yield between 0.3–5 μg of starting material, they should provide sufficient product for microarray experiments after amplification has occurred. We have also demonstrated that human xenograft core biopsies ranging from 0.5–5 μg of starting total RNA material yield Pearson Coefficients between 0.750–0.846 when the amplified core material is compared to the whole tumor. Taken together, these experiments demonstrate that core biopsies after linear amplification and either indirect or direct labeling can reliably be used for clinical oncology microarray studies. The authors thank the members of the ROSP Microarray Lab for producing the microarray slides used in this study and for providing assistance, and the Advanced Technology Center Microarray Facility for providing training and assistance. EG aided in study design, obtained and assisted in analyzing the data, and drafted the manuscript. SA aided in generating and analyzing data, and critically reviewed the manuscript. CM provided specimens and expertise in clinical study design, and critically reviewed the manuscript. EC manufactured all slides used in the study, provided expertise in the microarray process, and critically reviewed the manuscript. XL aided in generating and analyzing data. PT aided in data analysis and critically reviewed the manuscript. KC conceived of the study, assisted in data analysis, and aided in drafting and reviewing the manuscript. All authors read and approved the final manuscript.